After another shocking ritualist den found in Nigeria,i ask how many are there? How many ritualists dens really are there in Nigeria?I'm tired and shocked by how many have been exposed over the years.And all with severe consequences. The Police in Ogun State yesterday uncovered a suspected ritualists’ den at Iyana-Ilogbo, Otta in Ogun State.Two men were arrested at the den—an abandoned Ayokunnu Filling Station, a few metres from the Iyana-Ilogbo bus stop on the Lagos/Abeokuta Express Road. The remains of a male victim, clothes, shoes, wigs, a matchete and bags were found at the site. The suspects’ names were given as Babatunde Taofeek and Hammed Hassan. The Nation learnt that two persons who had initially been taken to the den to be killed, escaped and effort by the ritualists to recapture them failed. 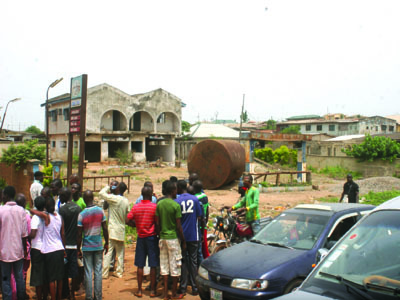 The failed recapture of the would-be victims attracted passers-by who swooped on the place and contacted the Police at their Sango Otta Station. Angry residents broke down parts of the building which led to the discovery of decomposing and decomposed human parts.Other members of the ritual gang were said to have escaped. Police Public Relations Officer, Olumuyiwa Adejobi, who confirmed the incident, said the den was discovered at about 7am, and that the Divisional Police Officer in charge of Sango Division and men of the Anti-Robbery Squadý acted swiftly and arrested two suspects. Adejobi said the suspects were found at the scene in possession of the lifeless body of a man believed to have been killed by their gang. He said:”Items recovered from the scene include a cutlass, clothes, shoes and caps, the suspects were at an abandoned filling station (Ayokunnu), at Iyana-Ilogbo.